Summertime is here! And the best way to cool off from the hot weather is to spend some time at the beach. 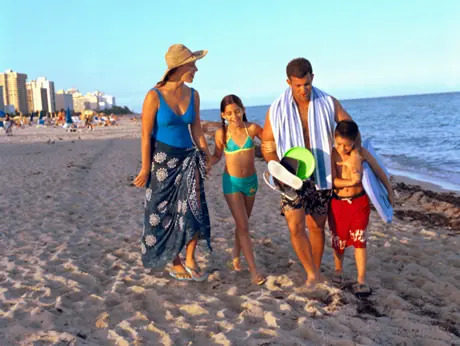 Beach time doesn't necessarily mean you lather on sunscreen and sleep in the sun as your kids run around. Use this time as family time-incorporate activities that both you and your kids will love. This is an opportunity for you to burn a few extra calories while your kids burn energy. Plus, running around in the sand is just plain old fun. This game requires you to use your muscles and find your inner warrior. What you'll need are four buckets. Fill each bucket up with sand. Next, pick a spot that you'll run to-about 50 yards out. You can use your beach chairs or towels as a marker. Basically you and one other person race each other to the markers and back while carrying a bucket in each hand. You'll work on your upper-body strength, lower-body muscles and endurance. To play this with younger kids, fill the buckets up halfway, or have them run without holding any buckets. Climb over a family-made sand mountain. Sprint backwards to your next obstacle. Do frog leaps and then sprint to the finish line. See who can finish the fastest-let the winner choose the next beach activity. Draw five rings in the sand (replicate a dartboard). Each ring is worth a certain amount of points. The center is worth five points, and each circle beyond the center is worth one less point. The largest ring is worth one point. Find pebbles on the beach to use as your darts. Stand several feet away from the dartboard and toss your pebbles; try to get as close as you can to the center. Wherever your dart lands is how many points you get. Play for five rounds; the person who gets the most points wins. After a long day at the beach, it's time to cool down. Go for a nice stroll along the water and search for eye-catching seashells. Maybe you and your kids can create a picture frame with the seashells you've collected, and then put a picture from the beach in the frame. Don't forget to wear plenty of sunscreen and drink water to stay hydrated. Have fun and enjoy your beach time. Sign up for a family-friendly race. Fara Rosenzweig is the Lifestyle Editor for Active.com. She is a fitness fanatic, yogi and runner who loves to try new activities.